Every wonder what it would be like to grab a bull by the horns and enter the exciting world of Pro Bull Riding. Well strap up. 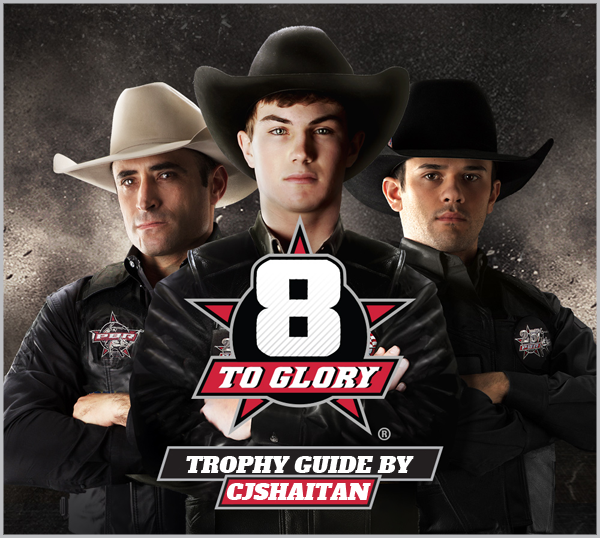 The official endorsed game of the PBR (yes it is a thing, I looked it up) is here, " The Toughest Sport on Dirt ". Forget Toro this is as close to the real thing as you will ever get without leaving the safety of your own home. QTE rhythm Bull riding at its finest, No Bull. Whether you are here for the trophies, leather or the lads there is something for everyone. Easy enough even an Australian city dweller can plat it. Can you last 8 seconds ? The game features a comprehensive tutorial which breaks down the 3 core mechanics. Press R1 as the circle contracts. For ideal placement aim to hit as the outer circle enters the orange inner circle, if correct it will glow green, if incorrect it will glow red. This continues for 6 seconds. To increase the points try to keep bull close to the centre of the arena with small direction adjustments. Only required if trying to achieve over 90+ points trophy. Begins around 6 seconds into ride, QTE button press rhythm game. The speed of the hits depends on the stability of the bull in previous stage and can range from 8 hits very slow to 14hits extremely fast when unstable. All statistics for trophy progression are tracked under " Statistics " then " Buckle "
Choose any rider play all 27 career events. Equip a piece of riding gear. Visit the store and purchase 60K booster packs until unlock every piece of rider equipment. Continue to replay final career event " Las Vegas " to earn 600K+ each time. Replaying final event will also reward with Pro riding gear. Once you have obtained all riding equipment switch to 20K booster packs continuing till 250 packs opened. Recycle riding equipment for extra money at least 100 times. Once 250 packs have been opened switched to 60K booster packs to save time. Continue until enough cards to upgrade all 40 riders. Replay final career event as required for additional money. Ride the Magic Train in Arcade mode aiming for a score above 90. This may take a few tries. In Arcade mode complete a succesful ride with all 40 riders in the roster. Continue to change Arenas until a successful ride in each of the 15 arena has been completed. In arcade mop up remaining unsuccessful rides by being bucked off. Simply mash through Grip Strength then leave controller idle for 5 seconds to fall. Replay event. Stats tracked in "Statistics" then "Buckle"
Nice job CJ, thanks for all the help. Thanks for the guide, was super helpful! May I add sth? . 1) Repeating and failing last event in career nets you only 600k, not 800k. 800k you can get only if you win it. 2) After winning it once, you will no longer get booster pack with lvl 100 items for 1st place in this event. There are 6 stages in this one. Once I completed only 2, then failed other 4, finished on 27th position and got 600k+booster with lvl 100 items anyway, so maybe you can get a booster for every 1-32 position once? 3) Once used item can not be transferred to another rider. Replacing of the equipment simply destroys the card. 4) While levelling up the riders you can also sell their cards (not sure if it counts for "Environmental hero" since I had it already). So if you maxed up one/some rider(s) you can sell his extra cards by pressing . If the rider is maxed, all the cards for this guy can be sold with no issues. Then buy another boosters, go to rider tab and check which ones are marked that can be levelled up->sell unnecessary ones, rinse and repeat. b) you are getting 600k in no time (arcade provides no money). After mashing for 0 grip, simply keep left or right, so you will fall in 0.7 sec. (saves 4.3 secs if you will left it idle ). 6) To unlock all pieces of equipment I had to get 3-4 pieces of lvl 100 equipment which means had to open two boosters from last event. 7) I managed to get 90 in Arcade for riding Magic Train with only one piece of lvl 100 equipment, since I sold rest by accident . What a grindfest (and unique trophy set ).